The esteemed poet Robert Frost once opined, “Good fences make good neighbors.” If that’s the case, then these 12 fiendishly offensive fences must make good neighbors… furious. Though haters may class them as classic fails, these fences do succeed at one thing: they never fail to give offense. 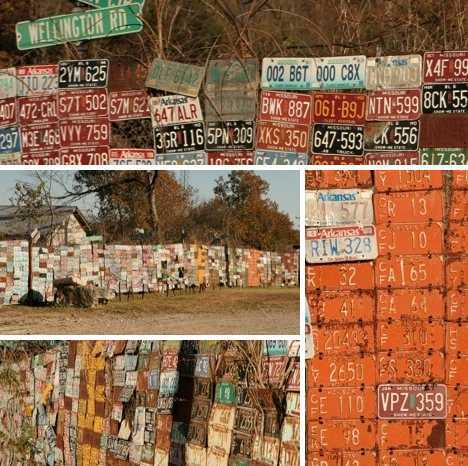 Galamba Metals in Sulphur Springs, Arkansas, decided to plate the fence encircling their auto scrap yard one day… which they did, using hundreds of license plates formerly affixed to formerly rolling stock. Perhaps someone at the company thought covering the existing fence with license plates would help mask an eyesore. The question now, is how to cover the eyesore covering the eyesore. Sulphur Springs is located in the northwest corner of AR near the state’s borders with Kansas and Oklahoma. 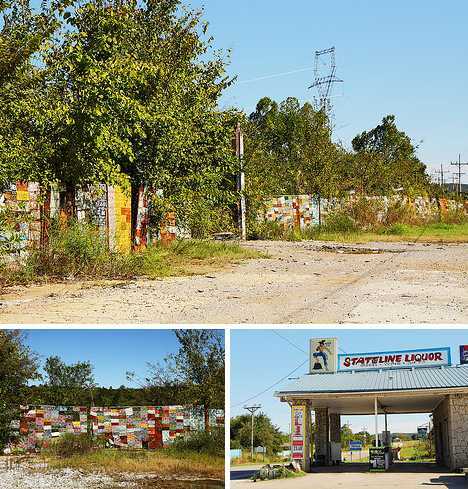 Visitors can find the Galamba Metals yard just steps from the Stateline Liquor store; visits to which are recommended both before and after viewing the license plate fence. Most folks like to kick back and relax when they retire, but Chris Barbee of Nowata, Oklahoma isn’t most folks. Barbee, you see, makes stuff from old bowling balls. Garden sheds, huge kinetic executive toys, fences… oh yeah, fences. 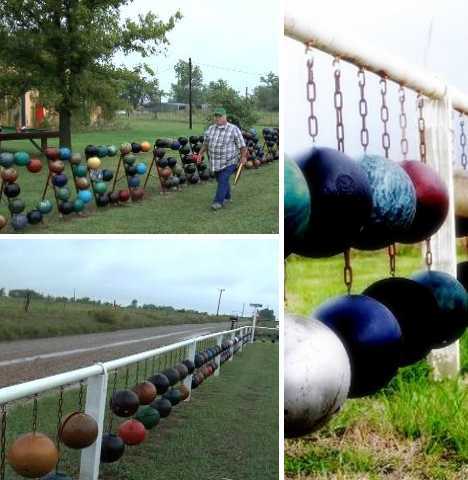 Since he gave up his day job – possibly as a pin-setter – Barbee has used his free time to build an 80-ft fence strung with dozens of bowling balls suspended from chains. It’s a frighteningly beautiful sight to see, even more so when tornadoes are forecast. Bowling isn’t as popular as it once was and hundreds of former alleys have closed down, which partially explains how Barbee (above) was able to scrounge up so many bowling balls. 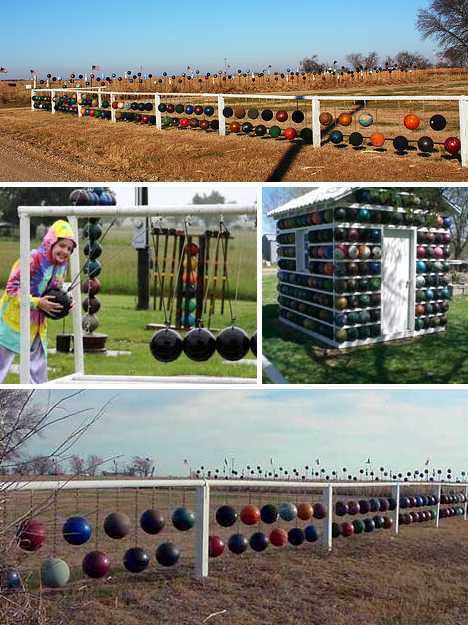 One wonders, though, what he did with all those bowling pins? 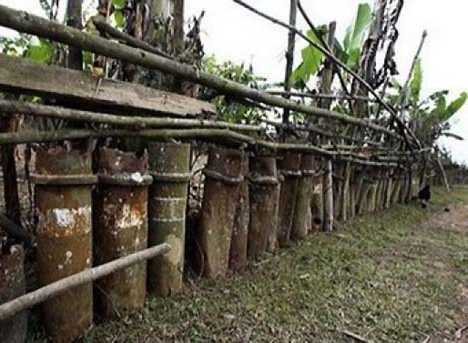 It’s estimated that around 30 percent of the 1.9 million tons of ordinance dropped on the Southeast Asian nation of Laos between 1964 and 1968 were duds. 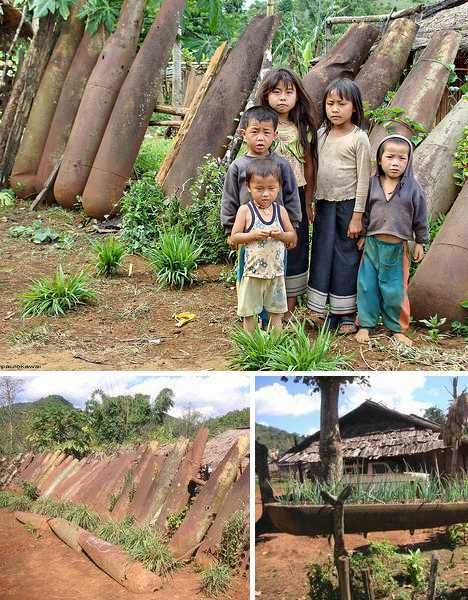 Though a waste of taxpayer’s money from our point of view, enterprising Laotians have salvaged a goodly portion of the UXBs and associated hardware, using the scrap to make… well, just about anything. Including fences. Sometimes a “No Trespassing” sign is, well, redundant amiright? And here we worry about pressure-treated wood being used in children’s playgrounds. Laotian kids are badass! “Hey, you got ski’s on my fence! 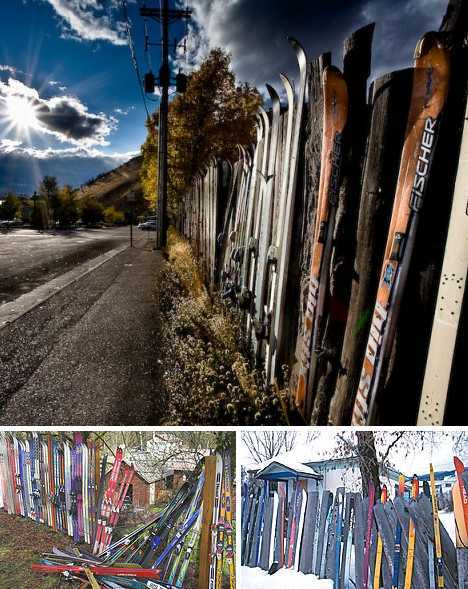 No, you got your fence on my ski’s!” All right now, before we witness the new sport of Ski Fencing and somebody loses an eye, I give you: Ski Fence! Or Ben Kullman does. 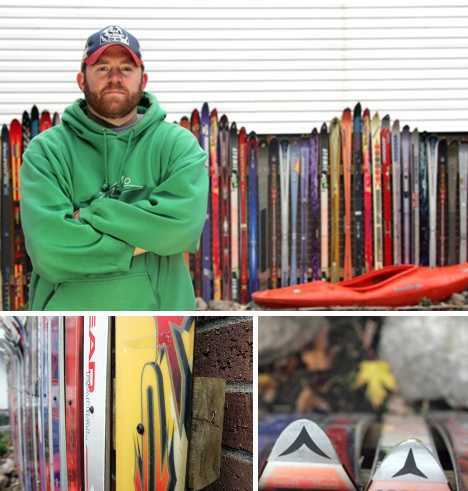 Kullman, inspired by ski fences that are said to be popular in Colorado, scoured the dumpsters, thrift stores and ski shops of Columbus, Ohio, to acquire the 75 pairs of skis he used to craft a cutting edge ski fence – and he didn’t spend a cent on the skis. Not every ski fence is as shiny, straight and symmetrically pleasing as Kullman’s ode to Rocky Mountain High. Screwing the skis one by one to a backing frame of 2x4s ensures the finished fence doesn’t look like someone drove a bunch of trashed skis into the ground after a few beers. Like, er, the slightly tipsy ski fence above. So you think you know about bras, huh? Let’s see.. You got the cups in the front, two loops in the back. All right, I guess that’s about it. Ahh, but in New Zealand, they add something: fence posts, and the great outdoors! 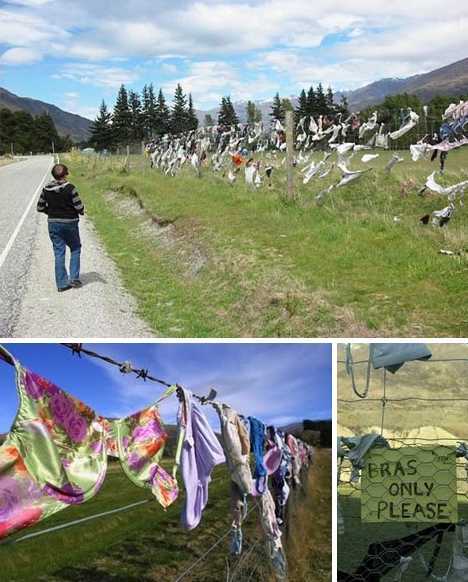 The legendary Cardrona Bra Fence in Central Otago, New Zealand started small – much like breasts themselves – when in late December of 1999 persons unknown affixed four bras to a fence running along a farm road in the Cardrona Valley. 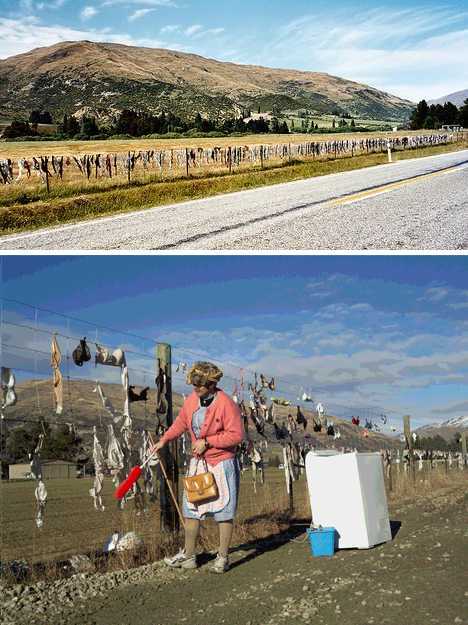 By February about 80 bras hung from the fence, swaying in the breeze and undoubtedly scaring the sheep. By October 2000 there were 200 and by 2006 there were nearly 800. Sadly, a few prudes complained and after determining the bra fence was on public land, the local council ordered the bras removed. They can do that?? Heck of a country, New Zealand! Tourists approaching Mayto Beach in Cabo Corrientes, near Puerto Vallarta, Mexico, may be excused if they don’t exactly feel welcome. 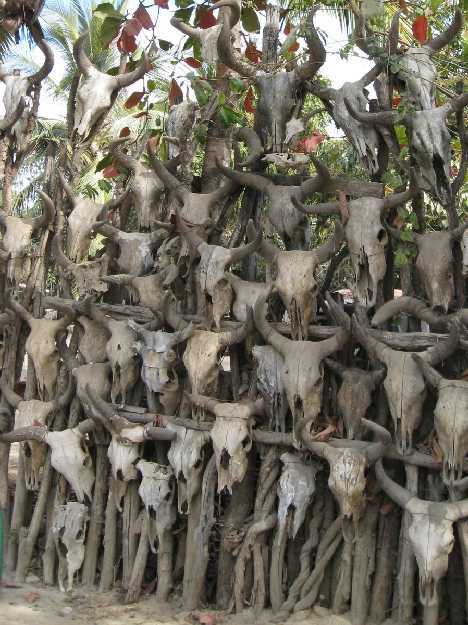 A fence festooned with cattle skulls has a way of doing that, you see. 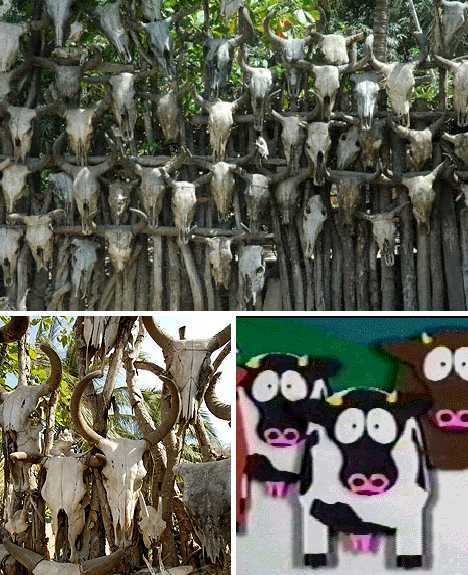 Mayto: where cows are headless and gringos are nervous. Mexico has a bit of an image problem of late, what with all the drug wars and mass graves. Somehow one wonders how a fence of skulls is going to affect travelers who are just looking to get away for awhile. 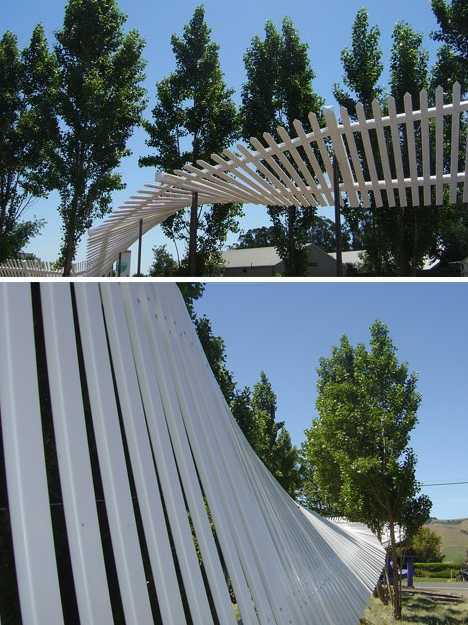 Word to Mexico: check out what other countries (cough*New Zealand*cough) are doing with their fences. 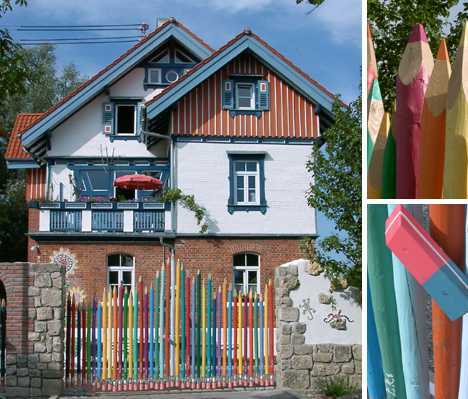 More of a gate than a fence, this child’s dream of a colored pencil fence is the work of an artist from Leipzig, Germany… and you know the Germans always make good stuff. Give ME some of that good stuff and there’ll be a pencil fence around my house too. The colored pencil fence really isn’t offensive, is it? Well, maybe if you had to come home to it every day for weeks, months, years… insidious und effective, no? Isn’t this the kind of gate/fence you’d see surrounding, say, an asylum? 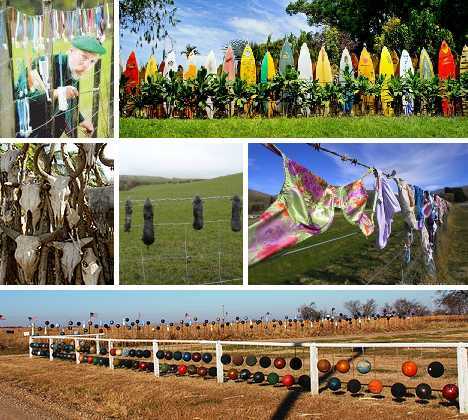 First the Bra Fence, now the Shoe Fence… what is it with New Zealanders? 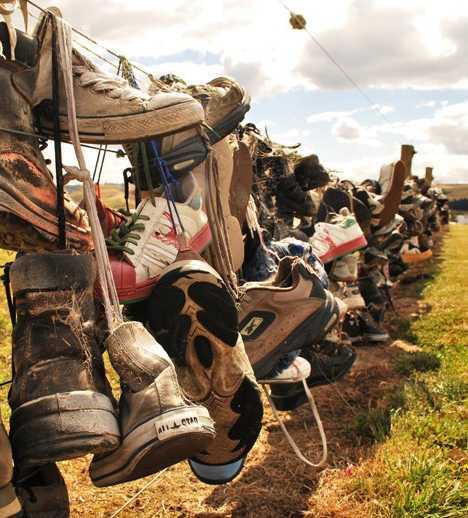 Though the Shoe Fence might not win any prizes, booby or otherwise, it stands as a testament to the human spirit. You’ll find it by driving south from Dunedin to Invercargill on South Island; just look out your window or, more likely, follow your nose. The Shoe Fence is offensive in a number of ways that even an accompanying Odor Eaters Fence can’t remedy. What if your neighbors were of Middle Eastern heritage, or the farmer next door was Ray Finkle? 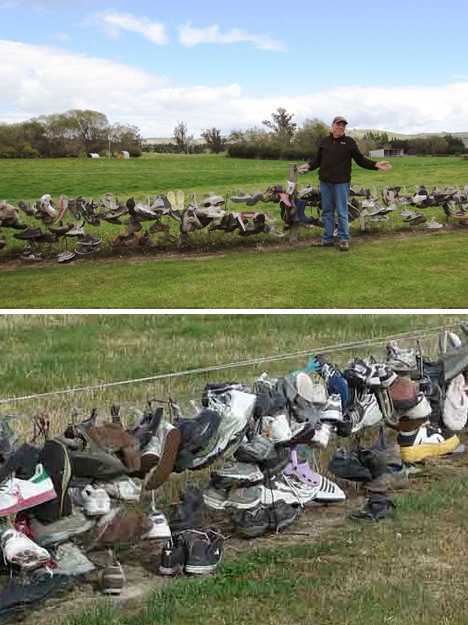 No matter, enough folks find the Shoe Fence appealing enough that it stretches to over 100 meters in length. I wonder what that is in feet? Either this homeowner got hold of some bad acid or he just hasn’t gotten around to repairing the damage from a very vicious twister. There’s always the possibility, however, that his “pets” come from the 4th dimension and he’s just doing his civic duty by keeping them confined. What to do with those worn out toothbrushes, hairbrushes, bottle brushes, even toilet brushes… does anyone ever wear out a toilet brush? 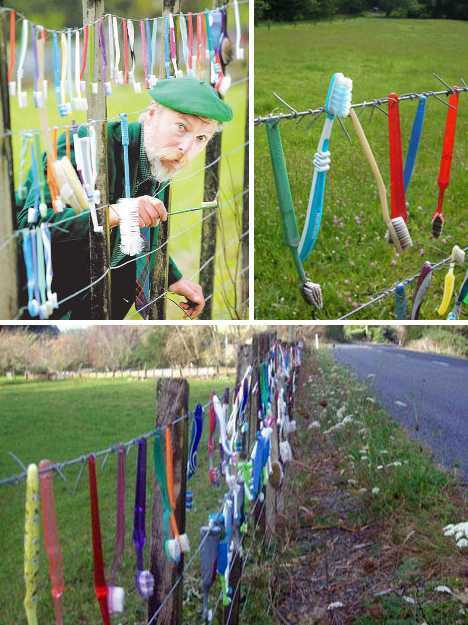 A somewhat eccentric gentleman by the name of Laird McGillicuddy Graeme Cairns (above, left) set out to build the world’s longest Toothbrush Fence. If it gets to be longer than his name, he’s accomplished something. 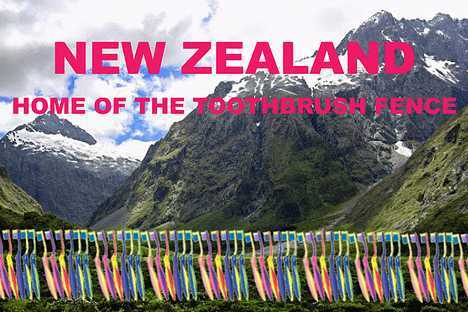 “All we need to do is add a few hundred more toothbrushes,” explains Mr. Cairns, “and people will flock from all over the world to see it, I’m sure.” People maybe, sheep definitely: sheep tend to travel in flocks and you’ll find plenty of sheep already in close proximity to the Toothbrush Fence, which is located in… care to guess? 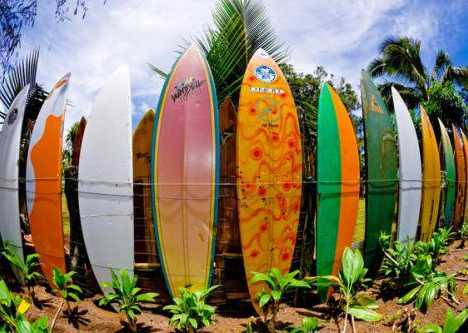 As Ski Fences are to Colorado, Surfboard Fences are to New Zea… er, Hawaii, sorry. 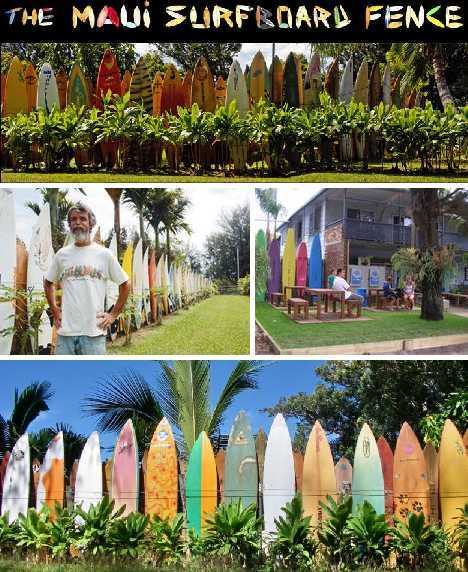 In 2007 a fence in Peahi, Haiku Maui, made using over 400 surfboards was recognized by the Guinness Book of Records as being the world’s largest surfboard fence. Who knew there was even a category? In the olden days, the English would display the heads of beheaded traitors on spikes along London Bridge. Those days have long passed but it seems some traditions die hard in Merry Olde England… albeit one doubts the moles above were in any way acting traitorous before they were caught, tried, executed and hung – though not drawn & quartered. Perhaps they were moles from the ministry. So what’s up with this gruesome practice? It seems that in the UK, Molecatchers (yes, there is such a profession) are typically paid not by the hour, but according to how many moles they catch. 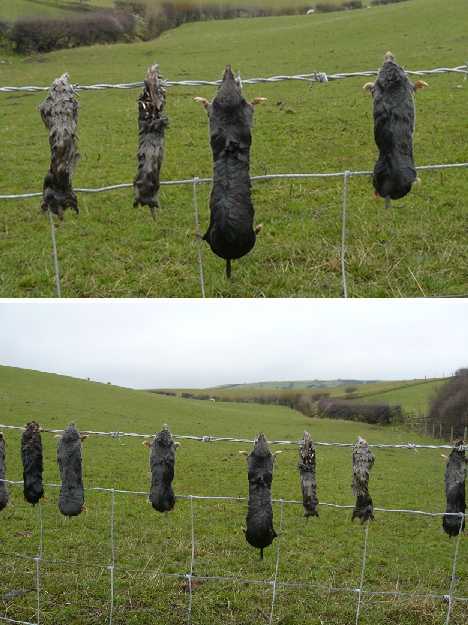 The moles are hung up on the nearest convenient fence for the employer to count at the end of the day. Then one & all enjoy a hot cuppa and scones while admiring the Mrs.’ new tea cozy. Jolly good!